Winter comes and brings cold nights. The first problem that stands after this period is not only the problem of heating but how to keep ourselves in fresh air even though people start spending more time indoors. Keeping warm and saving energy causes circulation decrease and the air inside homes often gets stale. It is necessary to filter contaminants out of the air in order to reduce common germs and bacteria when colds and the flu are at a peak. To deal with this problem Rabbit Air has developed an air filtration system. To improve indoor air quality it is important to update the filtration system in house by incorporating an air purification system or adding an advanced HEPA filter to home's furnace. What does it do? 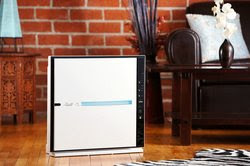 Increases circulation in the home, filters out the harmful germs and bacteria prevalent in homes during the winter months, trap pet dander, dust mites, pollen and allergens while eliminating smoke and odors from cooking and common household chemicals. A Los Angeles based company that plays a revolutionary role in the air purification industry; Rabbit Air manufactures environmentally friendly products with design in mind.